I have been having a ton of fun decorating these letters for one of my very favorite places to shop in Fishers, Best of What's Around. This set features papers from Karen Foster Design and some adorable stickers I found in a local supercenter. I love that every set of letters I make is unique! While the first set of letters was whimsical and juvenile, this set definitely has that retro flair! 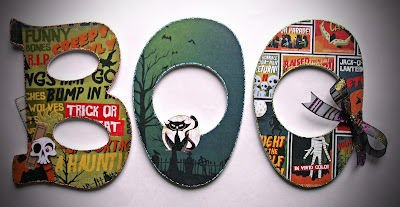 They also feature papers and stickers from Karen Foster Design in a horror movie poster theme. I added little touches such as filmstrip ribbon and tiny tickets to carry through the theme. Please send me a message if you'd like to own your very own set of decorated letters. I can create them for most holidays, sports, hobbies, or themes.